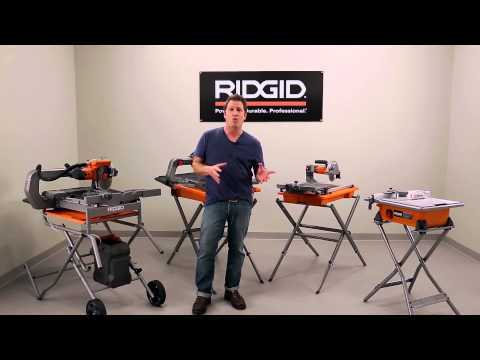 RIDGID introduces its new 8 in. Wet Tile Saw. 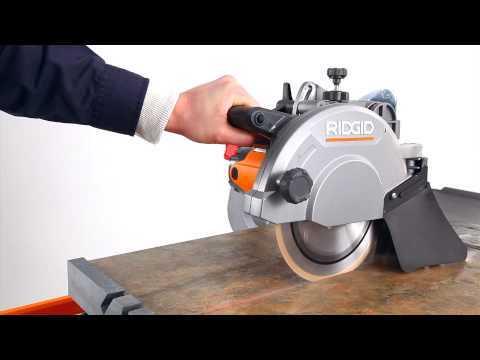 The powerful 12 Amp, 1.2 HP motor easily moves through natural and manmade tile and pavers while the oversized cut capacity is capable of cutting through 4 in. wall blocks in just two passes. The die-cast aluminum table with co-molded rubber support provides solid support and the dual bearing rollers improve table stability at your worksite. The optimized water nozzle system, guard baffle system, wrap around rubber splash guard, rear water tray and isolation wall provide maximum water efficiency and cleaner worksites. This table also comes with a folding stand that has tool-less height adjustment and scratch resistant feet to help protect flooring. Cutting Wheel Diameter 8 in. Max Depth Of Cut 2-3/4 in. Includes R4040 Tile Saw, Stand, Hex Wrench, 8" Diamond Cutting Wheel, Cutting Wheel Wrench, Rear Splash Guard, Folding Stand, Filter, Side Splash Guard, Miter Guide, Submersible Pump, Water Tray, Rear Water Tray, and Operator’s Manuals. 8 in. Wet Tile and Paver Saw is rated 4.0 out of 5 by 9. Rated 4 out of 5 by GPIslander from Pretty good tile saw, except... 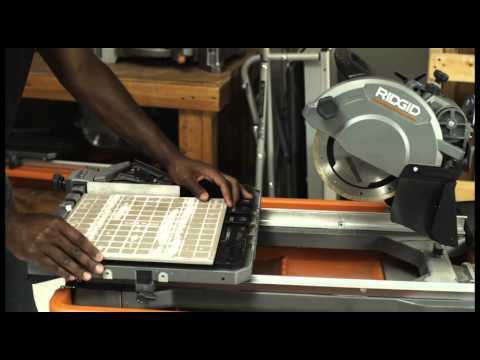 This tile saw is rated to be able to rip 24" long tile. While the distance from the backstop of the sliding table to the front edge of the blade is indeed more than 24", the table itself is only 13.5", leaving at least ten inches of tile hanging out in space when you make a rip cut. This is fine for ripping a square tile since there is alot of material to support that overhang. Unfortunately, ripping a very expensive 24" bullnose which is barely 4" wide to begin with seems no small risk of snapping the tile in half. I thought I'd use a piece of Hardibacker underneath the tile for support, but the backstop is only about 3/8" high so that the back edge of the bullnose piece will not be against the backstop. There should have been a removable piece of the backstop about five inches wide so that one could begin the cut with the skinny tile hanging out the back but against the angle stop until the cut is half made, then reinstall (with two Allen screws) the backstop and complete the cut that way.